Our simulator is built inside a real Boeing 737 nose section, giving you a realistic feel of flying. Using authentic components, everything from the cockpit door to the pilot seats to the control panels has been selected to create the perfect simulator. GoSimGo uses industry-grade software developed by Lockheed Martin. All major aircraft systems are simulated and the response of the controls are precisely calibrated, to give you an accurate feeling of piloting a real aircraft. This virtual world includes 24,900 airports, air traffic control, real-life weather and lighting effects, all displayed in rich, HD quality. Take off from an ocean-side airport in Turkey, fly over the Himalayas, cross the Pacific Ocean, and see the Hollywood sign as you land in Los Angeles! Create a fun and unforgettable flight path, and travel the world from the pilot's seat. To produce the most realistic sensation of flight, we use a custom-made 180° Visual System, with three projectors producing an HD image onto a 30 x 10 foot, perfectly curved, cinema-quality screen. The flight experience in enhanced by a powerful 12 speaker surround sound system, with 8 speakers inside the cockpit and 4 outside. The simulator is also equipped with two powerful shakers for producing realistic movements of the aircraft. Not only are the control system components authentic, the responsiveness of the controls has been perfectly calibrated to provide the most realistic feeling of handling the aircraft. 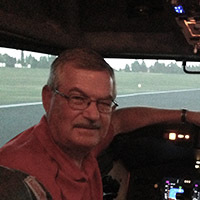 Whether you are flying, landing or executing parking brake procedures, you will experience precise, lifelike movements. Our high attention to detail means that our simulator is equipped with fully working and authentic cockpit dome lights, map lights, fuse panel light and overhead light. The interior has been fully restored and every part of our simulator is designed to give you a realistic Boeing experience. This 737-800 sim is true to form, complete with an actual cockpit. My flight through the Rockies from Calgary, followed by an auto-land in Cat III conditions gave me a complete demonstration of its capabilities, from the amazingly wide view out the window to flight characteristics with fully coupled autopilot. Whether you are seeking a thrill of flying an airliner or wanting to brush up on your flying skills, this device is sure to please. Well done Yevs! 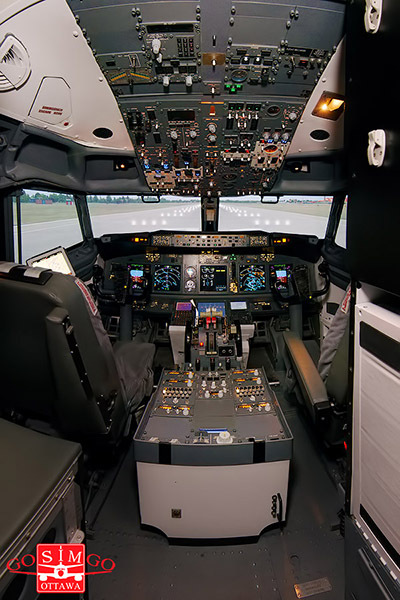 Do you think you could land a plane if all pilots suddenly get a heart attack during a flight (the sacred dream of every flight simmer) after years of using Saitek yoke and pedals? Try this simulator to find out that you hardly will. An incredible realism created by authentic parts in the cockpit and immersive outside view is strengthened by natural sound of engines and flight systems. You may do the whole flight in Vatsim or just recreate a particular situation, such as landing in TNCM or CATIII approach. Everything matters here: the wrong button pushed, the pitch trim adjusted incorrectly, a procedure not followed properly. You can hardly go further than this in flight simulation. A “must try” experience for every simmer. Thank you for the great and unique experience. The setup was very realistic and impressive. That's not your usual Flight Simulator, that you used to see on the screen of your computer, but the real-feel of the commercial plane, you can sometimes only peep when you boarding the plane on your overseas vacations. 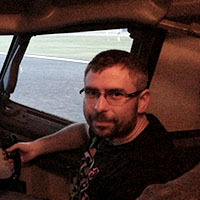 Everything in the cockpit made me feel like I'm in the real plane, the hum of the engines, the air conditioner, the smell and the 180 degrees window lookout, thanks to projectors and curved screen. 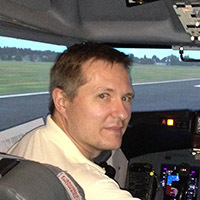 I never thought I would find myself controlling a plane and trying to land it at the airport - OK a simulator it might have been, but, boy it felt totally real at the time - and I now know why i am not a pilot! It is about as real as it can get, and I would certainly recommend this to anyone who has an interest in aviation. I can't believe you have made the whole thing from scratch. I can just admire the tremendous and meticulous work you have accomplished. This is the best way for regular people like myself to get a taste of a flight that only the pilots themselves or the very wealthy will have encountered before. You're never too old to try something new! Thank you again! I certainly hope to visit it again.